In October, the NOAA (National Oceanic and Atmospheric Administration) forecast a warmer than normal winter for our area. That’s not good news for us gardeners, or for our woody plants! Our shrubs and trees struggled all summer—and now into the fall—with higher-than-normal temperatures and lower-than-normal moisture. 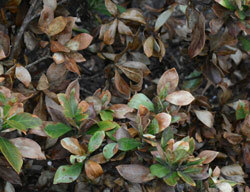 Once cooler weather arrives, even short increases in temperature can cause buds to break dormancy. And lower-than-normal cold snaps that accompany our increasingly irregular weather make things worse. 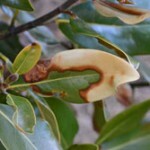 Which woody plants are most vulnerable? Plants aren’t equally sturdy. 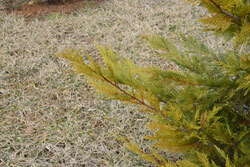 Make sure you know what shrubs and trees are in your landscape, as well as their specific requirements. Many popular landscape choices are only marginally cold hardy here in the mountains and your terrain has a lot to do with cold hardiness. 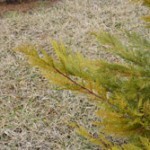 Cold air settles in low-lying areas of your yard. Whether a plant is on the north versus south-facing side of your home and has or doesn’t have protection from winds all affect how your plants fare. Evidence is mounting that woody plants with less chlorophyll (green) associated with the foliage—those that are variegated, gold, or purple—are less vigorous than all-green parent species. Bark split on Hinoki Cypress from freeze-thaw cycle. To protect your plants from those freeze-thaw cycles—as well as the sunburn, wind, snow, and ice that really do the damage, particularly at higher elevations—you need to provide some additional layers. For plant roots, a good layer of mulch is an appropriate defense. Mulch doesn’t keep the roots warm, but it does protect them from temperature extremes that come with the ground freezing then thawing. Similarly, protect the upper part of a tender plant by surrounding it with a “blanket.” Drive stakes into the ground around the plant and staple burlap to the stakes. Stuff the spaces between the branches with pine straw. 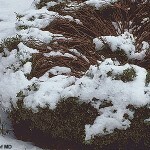 The intent is to keep the plant cold on warm days, rather than warm on cold days. This keeps dormant plants dormant! Avoid using plastic, which traps heat, causing temperatures to rise well above the temperature of the surrounding air. 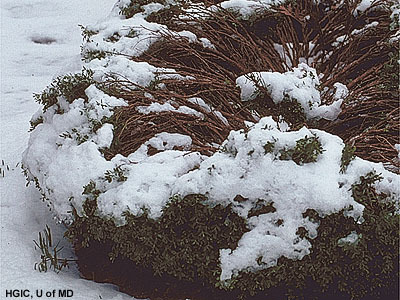 For evergreens, burlap may help protect from sun- and windburn. Anti-desiccant sprays purport to provide protection, but it may be short-lived. Making sure the roots are well-watered is a better plan to prevent woody plant loss. Should I Worry About Wildfire Threatening My Home? Wildfires in the news are a reminder that North Carolina ranks among the top states in the country for the number of homes in the Wildland Urban Interface: the transition zone between unoccupied land and human development. Homes adjacent to—or surrounded by—forests and other unoccupied land are at risk for wildfires, as are communities within one-half mile of this zone. The risk to your home, though, depends on many factors. – Do you have a combustible, wooden shake roof or wooden or vinyl siding? – Do you have decks, porches, or overhanging eaves that could trap heat from a fire? – Do you have large picture windows or vents that could provide heat access to the interior of your home? – Do you have combustible plants, such as ornamental grasses or evergreen trees and shrubs (pines, rhododendrons) within 35 feet of buildings? “Yes” to any of these questions may be reason for concern! – In case of fire, where would the fire department get their water? And whence cometh the water if the fire crew must bring water in and needs to replenish their tanks? Is a water source—such as a lake—readily accessible? – Are your street or road signs and mailboxes fireproof so that a fire crew can find you? I’m sure these questions will raise other questions! Consider asking your local fire department to make a visit, look things over, and give recommendations about how to make your property more firewise. Insurance agents may also make suggestions about improving fire safety. A final word: If you keep any important papers in your home, such as wills, titles, and irreplaceable photos, store them in a fireproof container. If you anticipate that an evacuation could be imminent, take action! Pack those documents and other priceless belongings, along with basic clothing and any medications you many need, in your vehicle. And park that vehicle headed out! With all the vagaries of our weather in recent years, my winter forecast is that it will be either warmer than normal or lots colder, leaning toward the latter. In either case, it would be wise to survey your landscape to see where some protection might be a good investment. The wisest approach is to select hardy Zone 5 plants for your landscape, then place them in a site that will take advantage of the terrain—or perhaps consider buildings for additional protection. South-facing slopes are great because of sun all year long, with cold air drifting downhill. In front of a stone wall is also an option because the wall retains heat. 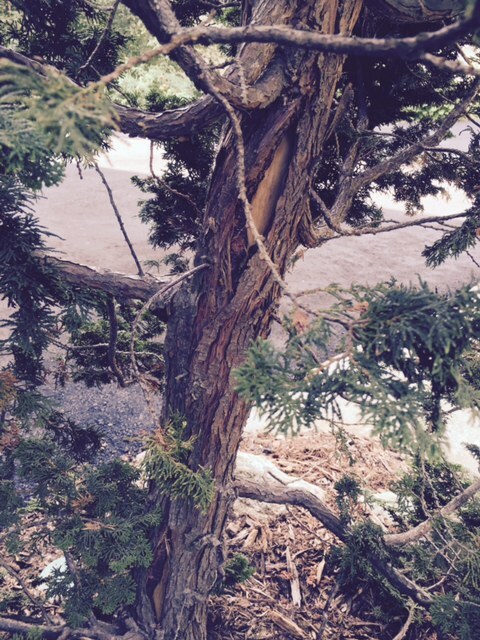 Cold damage takes different forms and affects foliage, buds, limbs, and trunks in different ways. Often it’s not the lowest temperature that does the damage, but instead, the duration and timing of cold weather. The 2007 Easter Freeze came after a prolonged warm spell, long enough to convince some plant species, like Japanese Maples, that spring had already arrived. 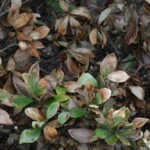 Even short variations in temperatures can cause buds to break dormancy and lose their hardiness. For the roots, a good layer of mulch is the appropriate defense. Mulch doesn’t keep the soil warmer but it does slow the freeze-thaw cycles. Once the soil gets cold it stays cold. You can protect the upper part of a tender plant by surroundings it with a blanket. To do this, drive stakes into the ground around the plant and staple burlap to the stakes as a curtain. Gently stuff the spaces between the branches and the burlap with straw. The intent is to keep the plant cool on warm days, not warm on cool days, which is why burlap is better than plastic. Burlap breathes, keeping the temperature more in line with the ambient, eliminating sudden, short periods of heat. Plastic, whether black or clear, traps the air and allows it to swing above ambient for short periods of time. The same concept can be used to protect evergreen plants against sun or wind burn. 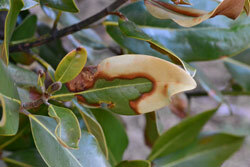 Waxy chemical sprays on the leaves can also help prevent desiccation from the wind. This is particularly appropriate for Rhododendrons in windy locations. To help prevent snow or ice from bending long, pliant branches on a tree or shrub, one can wrap the plant with tape or twine, like a Christmas tree. Written by Glenn Palmer, originally published in the Asheville Citizen Times.